Lynn Slaathaug Moen concentrates her practice in the areas of family law, collections, civil litigation, and criminal law. Her family law practice focuses on divorce, custody, adoption, guardianship, and domestic concerns. Her criminal law practice encompasses DUI defense, traffic infractions, misdemeanors, and felonies, while her civil litigation practice covers collections and other civil litigation matters. Lynn is a conflict attorney for North Dakota Indigent Defense, handling felonies, misdemeanors, and DUI cases. Lynn recognizes value in the personal client contact she's able to have at a smaller firm like Brudvik Law. 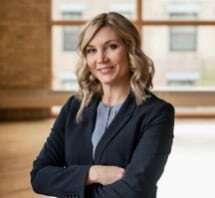 A Thompson, North Dakota, native, Lynn received her bachelor's degree from the University of North Dakota in business management and earned her degree of Juris Doctor with Distinction at the University of North Dakota in 2009. She is licensed in North Dakota and Minnesota, as well as the United States District Court of North Dakota. Lynn is a member of the State Bar Association of North Dakota in the family law and criminal law sections. She is also a member of the Ronald N. Davies American Inn of Court. Lynn has presented information on the admissibility of social networks at trial. Lynn and her husband Charlie, have two children and enjoy spending time with family and friends.